Please join us on November 15th at 6:30 p.m. in room 1231 in Engineering Building 2 for the final talk in the Fall Fidelity Investments “Leadership in Technology” Speakers Series. As General Manager for Strategy & Development at IBM Systems, Thomas is responsible for Strategy, Development and Client Experience for IBM’s POWER, Mainframe and Storage Offerings. In this role, she is responsible for setting and executing the innovation plans required to support clients worldwide. In addition, Thomas owns IBM’s WW Supply Chain Operations supporting all manufacturing. Previously she was General Manager of Storage setting the strategic direction of storage solutions focused on traditional data center and cloud deployment models. 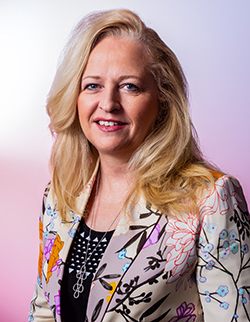 She played a central role in establishing IBM’s software defined storage Spectrum brand and enabling the growth of the Flash storage business. During her tenure at IBM, Thomas has held various product development and brand leadership roles. She was the Vice President of IBM Tivoli Strategy and Development where she focused on strategic solutions in support of Internet of Things and Cloud. From 2007 to 2009, she was the Vice President of Rational Development and Client Support responsible for worldwide development and support of the IBM Rational Software Brand, spanning enterprise and complex systems solutions. From 2004 to 2006, she served as Vice President of WebSphere Server Development, responsible for the expansion of the WebSphere Java business. Thomas earned a Bachelor of Arts degree in computer science from the University of Tennessee in Knoxville. Abstract: With the advent of Quantum based computing we will be able to explore new classes of problems that have not been practical with traditional computing methods. This session will provide an overview of how businesses are looking at quantum computing as well as potential applications. We will also discuss how NC State is partnering to help advance research in this field. The event is free and open to the public. Ample free parking is available on Centennial Campus after 5 pm. For directions and more information, click here. These lectures have been approved by the CSC Graduate Oversight Committee to count toward the required lectures for graduate students.